Asiad Steels is one of the familiar stockist and suppliers of SS 409 Stud Bolts, which is a ferritic rolled coil alloy that has an excellent grouping of corrosion resistance and heat resistance. Alloy 409 Tie Bars are also generally used in Catalytic converters, Farm machinery, Mufflers, Tailpipes, Structural hangers and support, Transformer cases, Heat exchanger tubing, Furnace parts, and more. Alloy 409 Threaded Bars are as well useful for “hard-to-form” hardware like fuel filters. Stainless Steel 409 Double Ended Studs is usual used in functions where presence is a secondary quality to mechanical attributes and corrosion resistance. Stainless Steel 409 Tie Bars is usually well-thought-out as a Cr. Alloy, by means of applications in automobiles exhaust systems and also applications that require weldability. The constancy of these Stainless Steel 409 Tie Rods is offered by the attendance of titanium, niobium, or both, in the configuration of steels. SS 409 Threaded Rods is long-established by special and standard corrosion assessments, along with widespread service experience. On the whole, the corrosion resistance of Stainless Steel 409 Threaded Bars is around as similar as SS 410. As a result, SS 409 Threaded Rods can be fashioned by using a lot of stretch-bending, pressing processes or mild roll forming. Stainless Steel 409 Threaded Rods is malleable and does not toughen to any considerable amount by cold functioning. Machining of this Stainless Steel UNS S40900 Stud Bolts makes draggy and tough chips by means of weighty build-up. We make Stainless Steel Din 1.41512 Stud Bolts by means of a usual content of chromium that makes sure with having excellent corrosion resistance in temperately corrosive atmospheres. 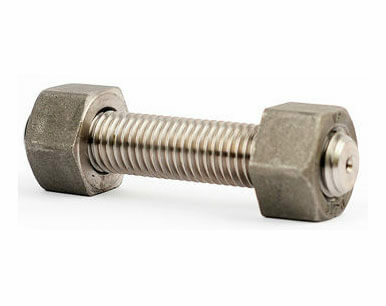 Buy 409 Stainless Steel Stud Bolts at reasonable rates from us. We are Exporter of SS 409 Studbolts in Worldwide Such as India, Austria, Namibia, Argentina, Belgium, Israel, Spain, Azerbaijan, Nigeria, Poland, Slovakia, Taiwan, Iran, Greece, Venezuela, Nigeria, Denmark, Serbia, Egypt, Puerto Rico, Oman, Czech Republic, South Africa, Zimbabwe, Ukraine, Colombia, Russia, Poland, Algeria, Belarus, Thailand, Norway, Mexico, Hong Kong, Mongolia, China, Iraq, Kuwait, Indonesia, Sri Lanka, United Arab Emirates, Mexico, Saudi Arabia, United States, Angola, Ireland, Jordan, Peru, Germany, Canada, Malaysia, Costa Rica, Chile, Morocco, Portugal, Tibet, Philippines, United Kingdom, Finland, Hungary, Sweden, Gabon, Nepal, France, Netherlands, Romania, Turkey, South Korea, Lithuania, Libya, Bahrain, Brazil, Bolivia, Italy, Japan, Bhutan, Estonia, Qatar, Trinidad & Tobago,Tunisia, Vietnam, Yemen, Iran, Kenya, Bangladesh, New Zealand, Kazakhstan, Switzerland, Ghana, Pakistan, Gambia, Ecuador, Lebanon, Singapore, Chile, Macau, Bulgaria, India, Australia, Afghanistan, Croatia. We are Suppliers of Stainless Steel 409 Stud bolts in India Such as Mumbai, Chiyoda, Navi Mumbai, Jakarta, Caracas, Chennai, Howrah, Hong Kong, Pimpri-Chinchwad, Abu Dhabi, Nagpur, La Victoria, New York, Coimbatore, Istanbul, Moscow, Hanoi, London, Surat, Noida, Seoul, Milan, Sydney, Kanpur, Mexico City, Muscat, Bangkok, Courbevoie, Thane, Karachi, Vung Tau, Ranchi, Madrid, Lagos, Ho Chi Minh City, Atyrau, Santiago, Bhopal, Ulsan, Kuala Lumpur, Toronto, Rajkot, Pune, Cairo, Busan, Ahmedabad, Lahore, Hyderabad, Haryana, Al Jubail, Kolkata, Tehran, Montreal, Ankara, Chandigarh, Rio de Janeiro, Ahvaz, Gurgaon, New Delhi, Algiers, Jamshedpur, Riyadh, Kuwait City, Singapore, Houston, Perth, Ernakulam, Thiruvananthapuram, Faridabad, Jaipur, Indore, Gimhae-si, Baroda, Colombo, Dubai, Nashik, Dallas, Manama, Calgary, Jeddah, Ludhiana, Edmonton, Secunderabad, Visakhapatnam, Al Khobar, Brisbane, Dammam, Vadodara, Geoje-si, Melbourne, Port-of-Spain, Aberdeen, Doha, Granada, Mumbai, Sharjah, Bengaluru, Bogota, Petaling Jaya, Los Angeles.